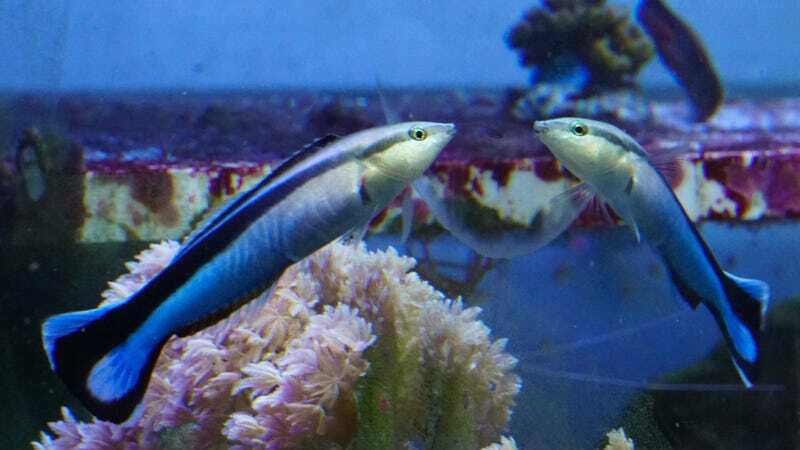 A cleaner wrasse looking at itself in the mirror. Psychologist Gordon Gallup first published the results of a mirror test in 1970 in the journal Science. Gallup introduced a mirror into the cages of four wild-born chimps. At first, they behaved as if they’d seen another individual by vocalizing and threatening. But after getting used to the mirror, they began using it to groom parts of their body they couldn’t otherwise see and to pick food from their teeth. To add evidence that the chimps knew they were looking at themselves, the scientists removed the mirrors, then put red dye on the chimps’ faces under anesthesia. They observed the chimp not touch their faces until they put the mirror back next to the cage, after which the chimps tended to the marks. Several monkeys were tested as well, and none demonstrated the self-directed behavior shown by the chimps. The paper concluded that the recognition would require an “advanced form of intellect” and would “seem to qualify as the first demonstration of a self-concept in a subhuman form.” The test has since been re-performed on the animals we now consider “smart,” like dolphins, elephants, and magpies. Fish don’t have limbs, so the experiment was a little more challenging to adapt to the cleaner wrasse. The team, composed of researchers from Osaka City University in Japan at the time of the experiment, introduced the fish to the mirrors and observed as some of the subjects behaved as if another fish were there. But the fish then begin to act strangely, by swimming upside-down or spreading their fins and quivering. When the scientists injected a colorless mark into the fish under anesthesia, the fish behavior didn’t seem to change much. Nor was there a behavior change when the scientists injected a colored mark into their throats. But after seeing the mirror again, three out of four tested fish appeared to posture in front of the mirror to better see the mark, then scrape their face on the ground, according to the paper published in PLOS Biology. They’re probably just using the mirror as a mechanism to see their body in the same way they can turn their head to see their body. “It’s certainly interesting,” researcher Diana Reiss, professor of psychology at Hunter College of the at the City University of New York, told Gizmodo, “but I think it really provokes more investigation.” She noted that the fish performed some of the “strange” behaviors without a mirror present. She also pointed out that one must carefully observe the behavior of the individual animals to determine if the behavior is truly strange for them. Another researcher, Frans de Waal from Emory University, agreed that the study was interesting and provocative, but told Gizmodo that “the behavior they show in the mirror test is open for interpretation, which is why some scientists, including myself, remain skeptical.” He, too, noted that fish do not have hands or arms, making the results more difficult to interpret. Jordan noted that the lab is working on replicating the study, and that he is devising further quantitative tests that he hopes will provide the overwhelming evidence that scientists are hoping for. He said that human prejudices about fish intelligence are causing the scientific community to hold his research to higher standards—it’s taken several years for the paper to pass through peer review, including journal rejections. He also pointed out that previous mirror tests have been performed on only a handful of representatives from the species, and often only two or three individuals actually pass the mark test. Perhaps the test just shows which species have faced selection pressures that require some individuals to recognize others among their ranks. “Many and a variety of kinds of approaches and tests should be used” to better understand animal intelligence, study author Masanori Kohda from Osaka City University in Japan, told Gizmodo. Ultimately, intelligence is multifaceted, and there’s much we don’t understand about animal cognition. Plenty of animals can perform incredible feats of “intelligence,” like chickadees that can remember the locations of food caches, honeybees that can do math, or octopuses with their surprising problem-solving abilities. Slime molds can solve mazes.